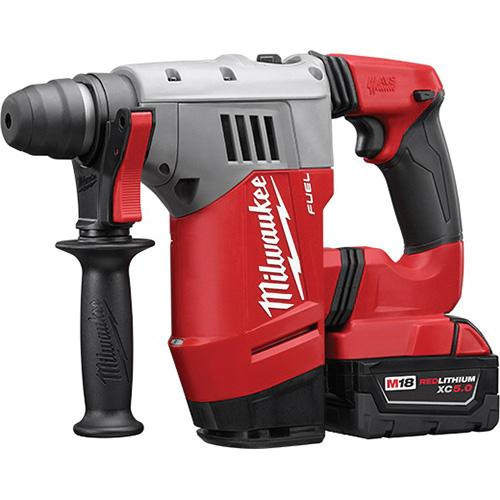 Milwaukee Tool M18 Fuel™ SDS-Plus Rotary hammer kit includes 1-1/8-Inch SDS-Plus bare tool rotary hammer, M18™/M12™ multi-voltage charger, two M18™ REDLITHIUM™ XC5 extended capacity battery packs, depth rod, side handle and carrying case. REDLINK™ PLUS™ Electronic intelligence allows advanced communication between your batteries and tools, permitting for unmatched levels of performance, protection and productivity. POWERSTATE™ brushless motor of rotary hammer gives more power, more runtime and longer life. This 12.8-Inch rotary hammer has AVS anti-vibration system that reduces vibration for maximum comfort. Durable REDLITHIUM™ battery pack provides more runtime, power and longer battery life. * Inventory displayed is accurate as of 04/18/2019 22:40 EDT.